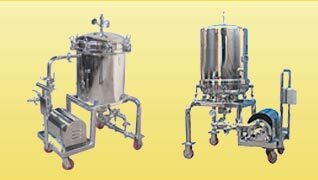 The Neelam Industries range of Filter Press is used for wide range of applications by several industries like Pharma, bulk drugs, distilleries, beverages & other industries. 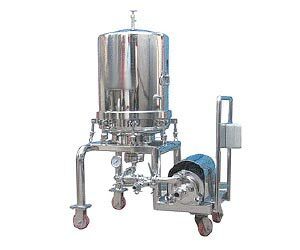 There are various combinations available in size & number of plates to give different filtration area 8 cake holding capacities to meet your process requirements. 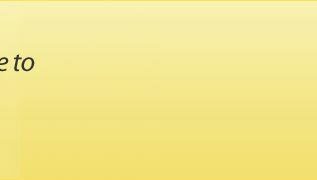 The work man ship, finish & make of components ensure best quality to meet the industries requirements. The unfiltered liquid is fed into the filter under positive pressure, where liquid travels in downwards direction and finds its way through opening on sides of the Filter Plates.As the liquid pressure increases, the Filter media holds the foreign particles and allows only clear filtrate to pass through the central channel formed by interlocking pressure cups to the outlet. 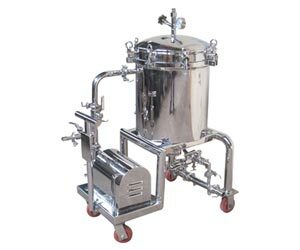 Filtration is continued until the cake holding capacity of the unit is reached or until the filtrate rate becomes too slow owing to cake resistance. Horizontal Plate Filter Press is enclosed construction, preventing evaporation, oxidation, leakage and fumes escaping from product. Filter plates are available in two sizes. Deep plate for large percentage of cake holding capacity and Shallow plate for small percentage of cake holding capacity. The horizontal filter plate and even thickness of cake, prevents the cake dropping as well as cracking, thus assuring better filtrate quality. 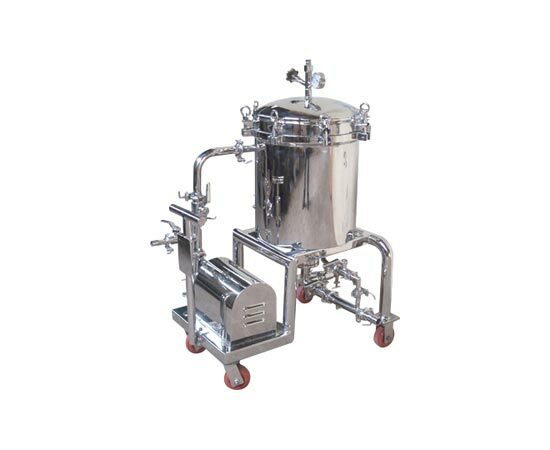 The Filtration area and cake holding capacity can be increased or decreased according to requirement. The Cartridge assembly consists of plates, perforated screens, spacers and fitter media. Interlocking spacers internally form single pipeline. The unfiltered liquid is centrally fed under pressure from bottom inlet. The liquids spreads out equally on each plate fitted with filter media. Solids remain on filter media and clear. filtrate flows through precisely made holes on sides of plates and collects in the shell, which then comes out through the outlet. In this process, solids are evenly distributed on each plate. The cake is then cleaned from the filter material and used again for filtration process. Full batch recovery, no separate scavenging system needed. 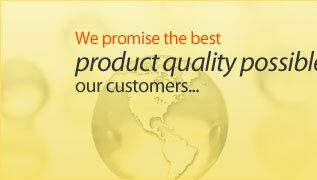 Proper sealing which allows the filtration of volatile, toxic and inflammable products. 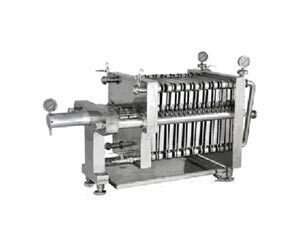 Plate pack arrangement ensures : Any type of filtering media singularly or in combination, can be used to achieve required micron efficiency. Easy removal and cleaning of the Cartridge Assembly. Closed System ensures : Filtration of toxic, hazardous, explosive materials. Efficiently cleaned and sterilized. 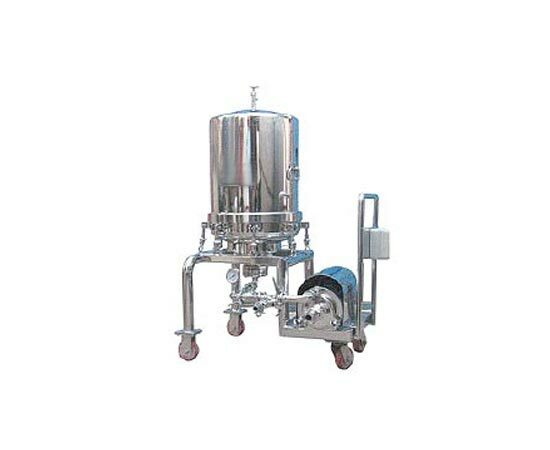 Central feeding ensures : No solid inside the vessel, complete recovery of liquids. Cake solids can be maximum dried with N2 Complete cake retains over the plate. Uniform filter-aid bed can be formed. Reduces the cost of expensive solvents. Filter media : Non-woven polypropylene cloth of 418 grade. Carbon loading : 5 Kg/m2 filtration area. Plate & Frame Type Filter Press is suitable for Kieselguhr / Sheet Filter for Coarse, polishing and Sterilizing filtration duties. 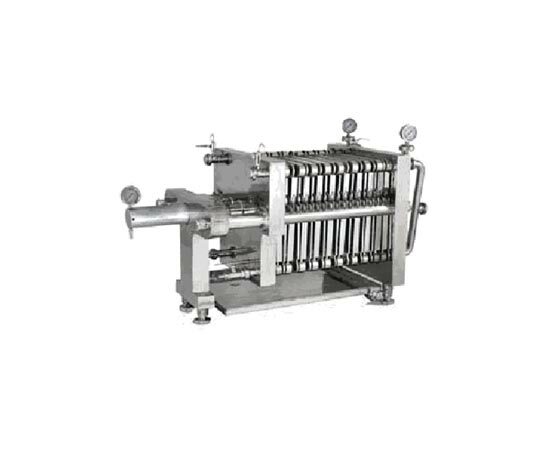 Filter Press constitutes of Fixed, Moving and Rocket body all of which are cladded with stainless steel sheets. All the joints are welded. The Fixed and Rocket body are connected with pipes, forming a self supporting chasis. Filter Plates, Frames and Moving body are Guided on chasis pipes. With the Aid of change over plate, filter press can be divided in two sections for two Stage filtration. 13mm Ltrs. 25mm Ltrs. 40mm Ltrs. Filtration of Sugar Syrup based liquid.